Home > Arsenal > Arsene Wenger > Danny Welbeck > Yaya Sanogo > Yaya Sanogo says "like me or not, i'll still be at Arsenal"
Yaya Sanogo says "like me or not, i'll still be at Arsenal"
Troubled Arsenal striker, Yaya Sanogo, has said he will silence his critics and prove he can score goals for the club. The French man who moved to the North London side last season from Auxerre, is yet to score in 17 competitive appearances. Speaking on his experience at Arsenal, Sanogo said that he struggled to adapt at the club but was confident that once he breaks the jinx of scoring, fans will see the best of him. “It’s been difficult to adapt to the league. There’s a lack of confidence, perhaps a bit of pressure too. You’re 21 and you play up front for Arsenal, it’s not easy. “When you come out of Ligue 2 and you end up in a duel with [Man City's Vincent] Kompany, it is not an easy task. “Once I’ve scored my first goal, everything will be fine. It’s their problem if they criticise me. I’ll still be here,” he said. 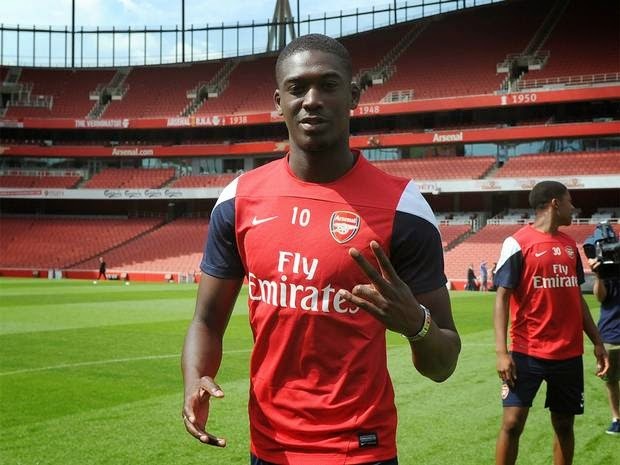 Sanogo sent a note of warning to new signing, Danny Welbeck. He said that Welbeck will have to battle for his place in the team.